Soy Foods, Friend or Foe - The truth about food and medicines. The Weston Price Foundation believes for a number of reasons that it is definitely not advisable to eat soy products. In the first place, high levels of phytic acid in soy reduce the assimilation of calcium, magnesium, copper, iron and zinc. Phytic acid in soy is not neutralized by ordinary preparation methods such as soaking, sprouting and long, slow cooking, but only with long fermentation. It is known that high-phytate diets have caused growth problems in children. Trypsin inhibitors in soy interfere with protein digestion and may cause pancreatic disorders while soy phytoestrogens disrupt endocrine function and have the potential to cause infertility. 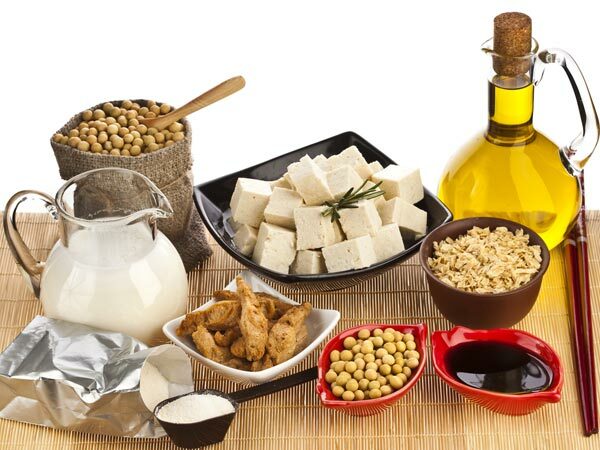 In some studies, soy appears to work in concert with human estrogen to increase breast cell proliferation and the chance of mutations and the formation of cancerous cells. Soy foods actually increase the body's requirement for vitamin B12 as well as for vitamin D. Synthetic vitamin D2 which can become toxic, is added to soy milk. The processing of soy protein results in the formation of toxic lysinoalanine and highly carcinogenic nitrosamines. Free glutamic acid or MSG (mono sodium glutamate) a potent neurotoxin, is also formed during soy food processing and additional amounts are added to many soy foods to mask soy's unpleasant taste. Soy foods may contain high levels of aluminum, which is toxic to the nervous system and the kidneys. Dr. Joseph Mercola points out that an important distinction must be made when talking about soy and that is to highlight the difference between unfermented soy products and fermented soy products. This is something that has led to confusion in the Western world. Dr. Mercola is convinced that the health risks associated with unfermented soy products far outweigh any possible benefits. In an article written for his website he explains the difference between the two. For centuries, Asian people have been consuming fermented soy products such as natto, made from fermented soybeans, tempeh, a fermented soybean cake, miso, a fermented soybean paste used in miso soup, and soy sauce and enjoying the health benefits associated with them. Fermented soy does not wreak havoc on your body in the way that unfermented soy products do. Tofu is not recommended as it is not fermented. There is also the issue of eating genetically modified (GM) soy. In the US, over 90% of all soy grown is genetically modified Roundup Ready soy, which has an array of additional health hazards associated with the toxic weed killer, glyphosate. Unfortunately, many Americans who are committed to healthy lifestyles have been grossly misled into believing that unfermented and processed soy products like soymilk, soy cheese, soy burgers and soy ice cream are health foods. When Dr. Kaayla Daniel published her book ‘The Whole Soy Story: The Dark Side of America’s Favorite Health Food’ in 2005, she highlighted thousands of studies linking soy to malnutrition, digestive distress, immune-system breakdown, thyroid disfunction, cognitive decline, reproductive disorders, infertility and even cancer and heart disease. The only soy with health benefits that Dr. Daniel would ever recommend is organic soy that has been properly fermented. After a long fermentation process, the phytate and ‘anti-nutrient’ levels of soybeans are reduced and their beneficial properties become available to the digestive system. Dr. Daniel observed, "Unlike in Asia, where people eat small amounts of whole soybean products, western food processors separate the soybean into two commodities, protein and oil. There's nothing safe or natural about this. Today's high-tech processing methods not only fail to remove the anti-nutrients and toxins that are naturally present in soybeans but leave toxic and carcinogenic residues created by the high temperatures, high pressure, alkali and acid baths and petroleum solvents." Kristen Michaelis, an advocate for REAL FOOD, writes that after decades of marketing spin about how soy is a wonder food; a protein-rich legume able to reduce our dependence on meat, it is understandable why so many people have yet to understand fully the dangers of soy. Soy has a higher content of phytoestrogens than just about any other food. Phytoestrogens are plant-based estrogens that mimic estrogen in the body. In recent years, there have been studies indicating that phytoestrogens are good for you, but Michaelis claims that the soy industry itself funded the studies. Independent research has shown clearly that consuming phytoestrogens is dangerous for the human body. She points out that a leading cause of breast cancer, endometriosis, uterine fibroids, infertility and low libido, is unopposed estrogen or estrogen dominance. Why, then, she asks would anyone argue in favour of consuming more of a food high in estrogen? Michaelis reveals that an infant taking the recommended amount of soy formula is consuming a hormone load equivalent to 4 birth control pills a day! She links this with the dramatic rise in precocious puberty with girls starting their periods as young as 6 and 7 years of age. In her book ‘Real Food’: What to Eat and Why’, Nina Planck explains the history of soy. Soy farming started around 1100 BC in China, where it was used to build soil fertility and as feed for animals. Soy beans were not considered fit for humans until the Chinese learned to ferment them; a process that makes them digestible. It is said that the Japanese and Chinese eat about 10 grams (two teaspoons) of fermented soy per day, usually as a condiment, yet a soy manufacturer recommends Americans to eat ten times what the Japanese eat, that is 100 grams of soy protein per day. Fermentation takes care of many of the dangers of soy. In addition, the typical Asian will also consume soy with mineral-rich and nutrient-dense foods such as fish broth that is naturally high in iodine and other minerals that support the thyroid. According to Planck, the soybean was a modest and unpopular crop until food manufacturers, intent on creating cheap vegetable oils, convinced the U.S. government to start subsidizing it. The soy was turned into oil, and the industry was left with an industrial waste product. “Then somebody had a brilliant idea: Let’s take this industrial waste product full of toxins and carcinogens, isolate the soy protein and turn it into food that people will eat! Soy foods were born”. The industrial processes that go into producing soy milk make uneasy reading. It involves first washing the beans in alkaline or boiling them in a petroleum-based solvent followed by bleaching, deodorizing and pumping them full of additives then heat-blasting and crushing them into flakes, finally mixing them with water to make “milk.” This process only adds more dangerous chemicals without removing any of soy’s natural toxins. From 2000 to 2007, food manufacturers in the U.S. introduced over 2,700 new foods with soy as an ingredient, including 161 new products introduced in 2007 alone. Here in Europe we are blessed with a huge variety of vegetables, fruit, meat and dairy products; time tested, traditional food that we have been eating for decades. Why change to include food to which we in the West are not adapted?